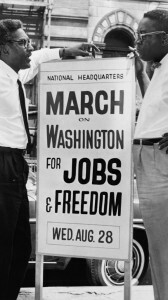 Yesterday marked the fiftieth anniversary of the historic March on Washington for Jobs and Freedom in which, on August 28, 1963, more than 200,000 marchers converged on Washington D.C. to call for an end to discrimination and a legal pathway forward to racial equality. Now is the time to rise from the dark and desolate valley of segregation to the sunlit path of racial justice. 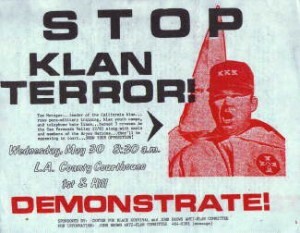 Now is the time to lift our nation from the quicksands of racial injustice to the solid rock of brotherhood. Now is the time to make justice a reality for all of God’s children. But even as we remember how Dr. King balanced the need for civic action with the need to act civilly in his rhetoric, it is easy to forget that the March on Washington for Jobs and Freedom was itself an example of that philosophy in practice. The degree to which that order and that amiability came as a surprise reveals a great deal about the racially tinged lowered expectations of the newspaper in 1963 — and of the nation as a whole. And yet it is still worth noting that in its appraisal of the marchers’ tenor and actions, the New York Times was not wrong. In preparation for the March, the city of Washington D.C. brought in National Guardsmen to police the streets, and deputized firefighters. Area hospitals cleared schedules to make room for expected riot casualties, and local jails cleared cells in preparation for mass arrests. But there was no riot. And there were no mass arrests. And the single largest policing action of the day did not involve African American marchers at all, but was the dispersion of fifty members of the American Nazi Party who had turned out to stage a counter-protest. In his acceptance speech for the Nobel Prize one year later, Dr. King said that the crucial political and moral question of our time is the need for man to overcome oppression and violence without resorting to violence and oppression. 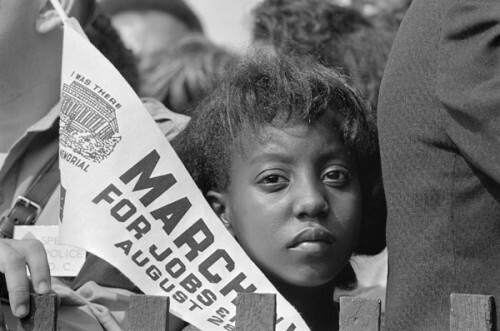 And the peaceable, orderly, civil March on Washington for Jobs and Freedom stands as one kind of answer. On August 28, 1963, marchers, speakers, and protesters on the National Mall reached out with civility, not violence, to demand redress for a lingering, suppurating wrong. And to that gesture — sometimes slowly, and sometimes through a veil of violent resistance to change — civil hands reached back. * Tom Wicker. “President Meets March Leaders.” New York Times, August 29, 1963.